Indexes are selling-off modestly for the first time since breaking above the recent trading range. Is this a good time for people who missed the recent run to get in, or a last chance for those still holding stocks to get out at a decent price? In typical fashion, the arguments for both directions are equally compelling. If we use the strength of the follow through day and the performance of the recent rally’s general, AAPL, as a benchmark, it seems less than an ideal foundation for a material move higher. But on the other side, the markets often climb a wall of worry and it is this very uncertainty that provides the best opportunity to buy early weakness and hold for a profit as other investors slowly come around. I am fighting a negative bias and I don’t want to let it skew my outlook, but I still find myself suspicious of this rally. There are a lot of good stocks holding up well in this weakness, but I have yet to pull the trigger on any of them since the follow through day. 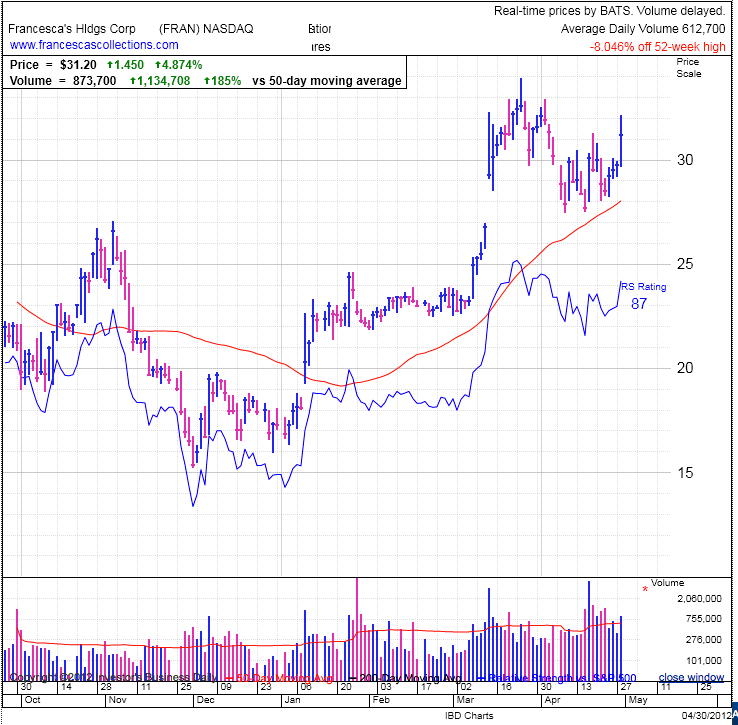 FRAN is having a great day, up 5% in a continued bounce off of its 50dma. 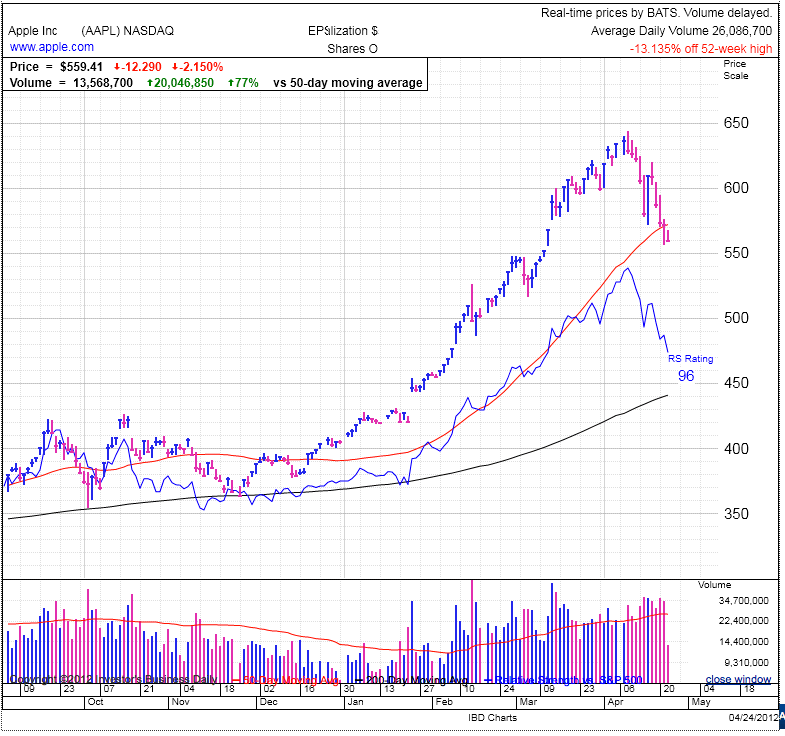 LNKD is also showing impressive strength after its own 50dma bounce. SWI is holding on to an impressive move off of last week’s earnings. On the other side, AAPL is extending a 3-day slide after its blow-out earnings. It is pushing down toward its 50dma and a bigger risk will potentially be a test of the recent $555 low. It seems at the moment everyone who wants AAPL already owns AAPL and no one is left to rush in and prop up the declining price. 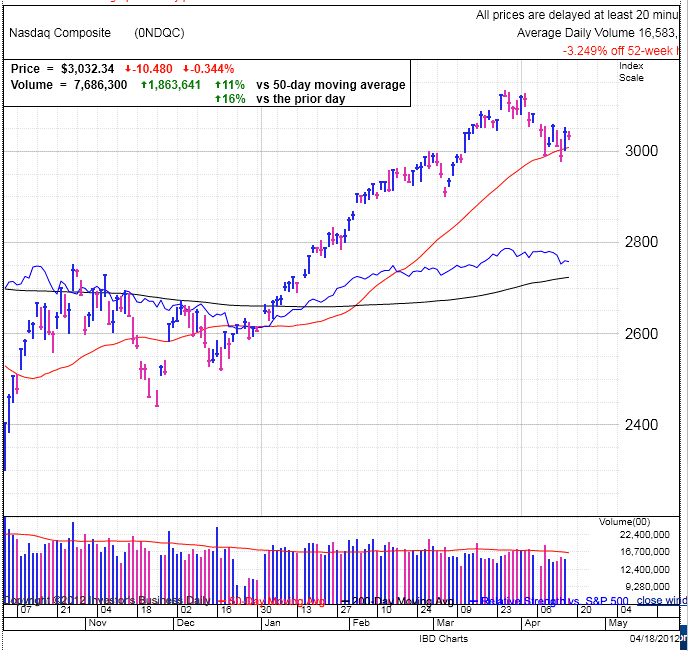 The indexes continue to hold recent gains and are edging higher. 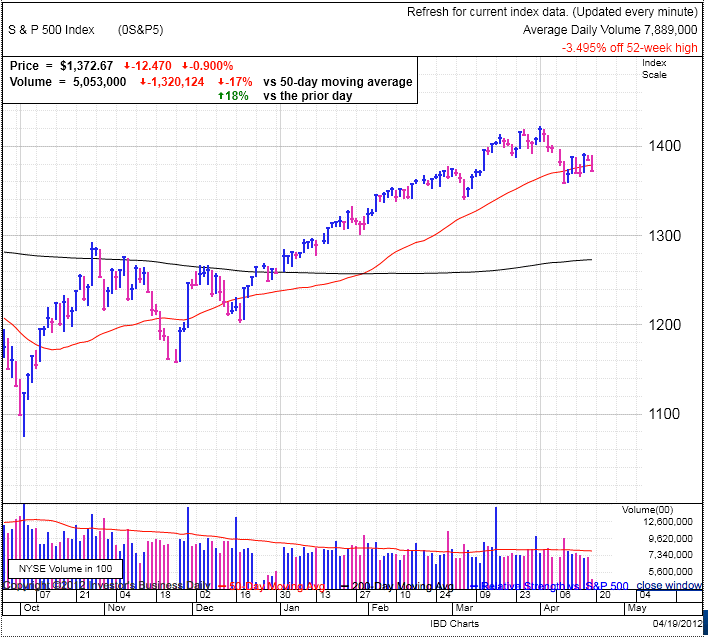 The S&P500 is above 1400 and sitting above the recent consolidation area. Today the NASDAQ joined the S&P500 by also poking its head above its recent range. These developments continue to be constructive and supportive of yesterday’s Follow Through Day. With this positive price action, there is no reason not to venture in and try some promising stocks. Start with 1/2 positions and add on as the market continues to move up. From a sentiment point of view, it seems like the number of bulls and bears is fairly balanced and the lack of a disproportionate disparity most likely means the moves going forward will be more modest. Extremes in the market tend to coil up the spring and today there is not much energy bound up in the spring. Of course this balance rarely holds up and over time we’ll see the market skew one way or the other based upon headlines, price movements, and group think. There are some interesting individual stock stories (AAPL, AMZN, SWI, GNC, etc), but as far as the indexes go, they are fairly boring at the moment. Give it a few weeks and no doubt traders will find some kind of drama to start obsessing about. 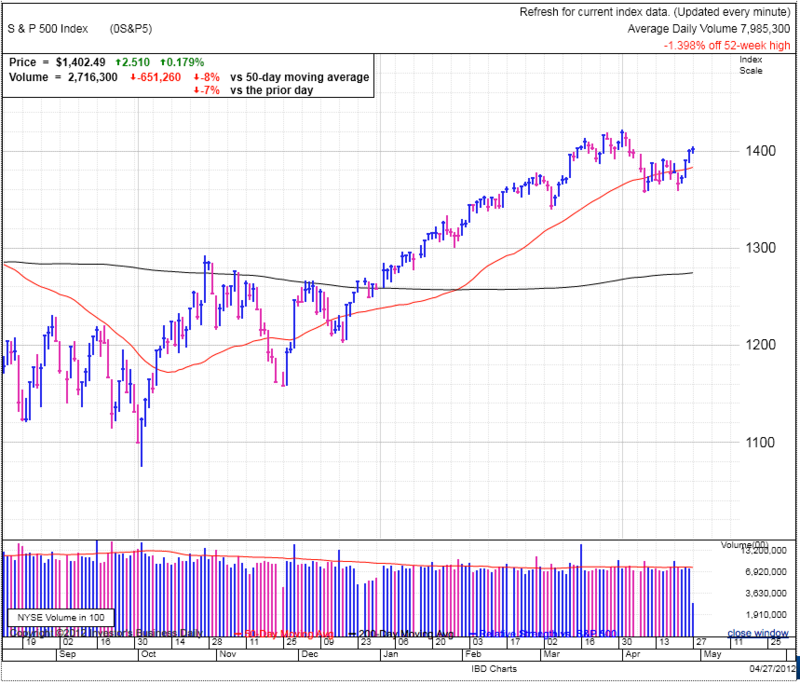 IBD called yesterday’s 1.4% gain on the S&P500 a day 11 follow through and we are back in a Confirmed Uptrend by their measures. But waiting more than two weeks for the follow through, having average volume on the FTD, and making just 1.4% gains are three separate signs that this FTD is less potent than ideal. That doesn’t mean this one can’t work, just in the past FTDs with this less than compelling action are more prone to failure. No doubt we can find weak FTDs that worked, but on average they have a lower success rate than more powerful ones. The best thing we can do is watch the subsequent price action and not jump into this market head first without waiting for more compelling evidence to support this FTD, namely positive price gains. Start buying good looking positions and then add on when the price increases. This will let you in the market, but also manage the risk if things breakdown. As for where we are, the markets are mostly flat today on light volume. The SPX is at the upper end of the recent trading range, just poking its head above. The NAS is in the upper half of the range, but still has a bit more progress before breaking above it. The market seems unsure of itself at these levels as neither the bear nor the bulls have the courage to buy or short this market and it is a staring contest between the two to see who will blink first. So far the market has found good support at the 1360 level as we bounced off of that twice. A third trip to that level would be fairly bearish as there is no such thing as a bullish tripple-bottom. On the upside, we have taken a few weeks to digest recent gains and flushed out some of the irrational exuberance leading up to the end of the first quarter. The bulls were humbled by the pullback and the bears will humbled by the bounces off of support. So in these regards, the clock has been reset for both groups and we are just waiting on the price action to see which side has greater strength. Being at the upper end of the trading range means the bulls have a slight edge and just need to push us a tad higher before traders start buying the breakout. But given the positive sentiment over yesterday’s price move and regaining the 50dma, it is disappointing that there is not more follow on buying today. No doubt this indecisiveness will continue the lower volume trading we’ve seen over the last few months. But as traders, price is truth no matter what the volume is. We have seen positive price action from the leaders that weathered the storm and there look to be good buys to invest in. I continue to be cautious and am not sold on this FTD yet, but further gains will get me in the market with both hands. If we can’t hold above the recent consolidation, there is most likely more left in the downside move. AAPL blew away estimates again and is single-handedly lifting the market today. Most of AAPL’s strength comes from iPhone sales in China as they missed iPad and Mac expectations. The one upshot is these quarterly results don’t include a Chinese release of the new iPad, which will provide a big boost for next quarter’s results. But AAPL is warning of a slowdown in iPhone sales going forward as customers hold-off in anticipation of an iPhone5. 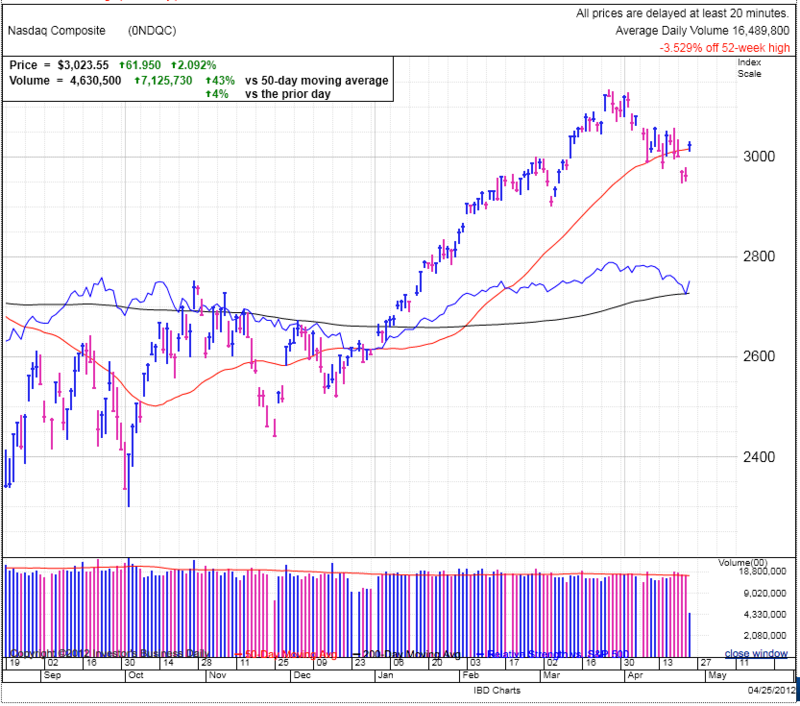 As for how this affects the rest of the market, we are experiencing a nice pop today and all three major indexes retook their 50dma, but are still within the previous consolidation range, so not a technical breakout yet. Today’s 1% and 2% gains are great to see after the recent weakness, but don’t constitute a follow through day because declines over the last few days reset the rally count. This is day two for the S&P500 and day one for the NASDAQ. We need a strong follow through day on Friday or next week to signal this market is ready to rebound. And given where we are, it seems prudent to allow the market a couple days to prove itself since today’s rally is the result of a single company. The challenge will be to see if AAPL’s results can reverse the bearish sentiment we’ve seen in the markets as of late. Is AAPL stronger than the markets, or are the markets stronger than AAPL? And of course it doesn’t have to be an either/or as AAPL could decouple from the markets and continue higher in the face of wider weakness. But again, sit tight and wait for that confirmation to demonstrates it is safer to venture into the market. We give up some profit by waiting, but we decrease the risk of losing money by being patient. A rough start to the week for the markets as we are down 1%+ in the first couple hours of the day with all three major indexes crashed through their 50dma. The S&P500 and Dow are still trading in their recent consolidation areas but the NASDAQ broke support and is making a new relative low. 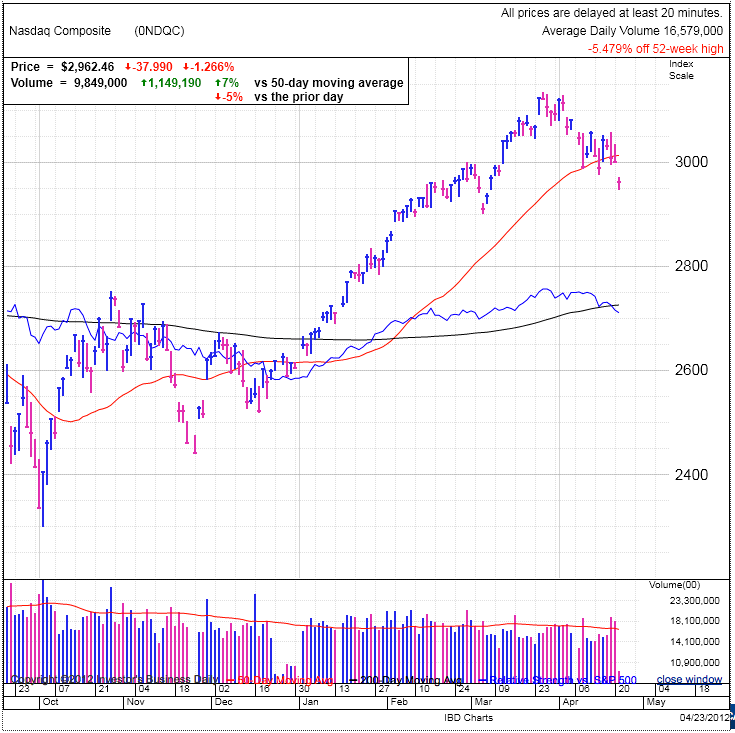 This continues the trend of under-performance by the NASDAQ and demonstrates weakness by technology and smaller, growth companies. Given the huge run-up and out-performance by the NASDAQ in Q1, profit taking and rotation out of this sector should not come as a surprise. Traders watch moving averages and trade off of them, but are secondary in psychological impact when compared to technical levels represented by concentrations of actual buying and selling activity. It is one thing to see your stock fall under a moving average on volume, but seeing your stock fall under its purchase price generates far more anxiety. 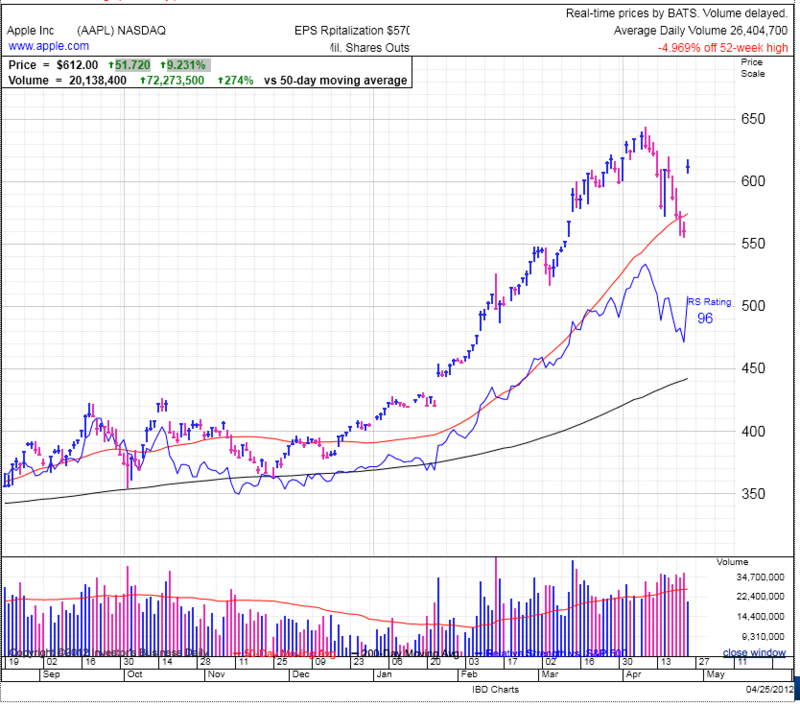 This causes breaks under support to be far more powerful than drops under moving averages. 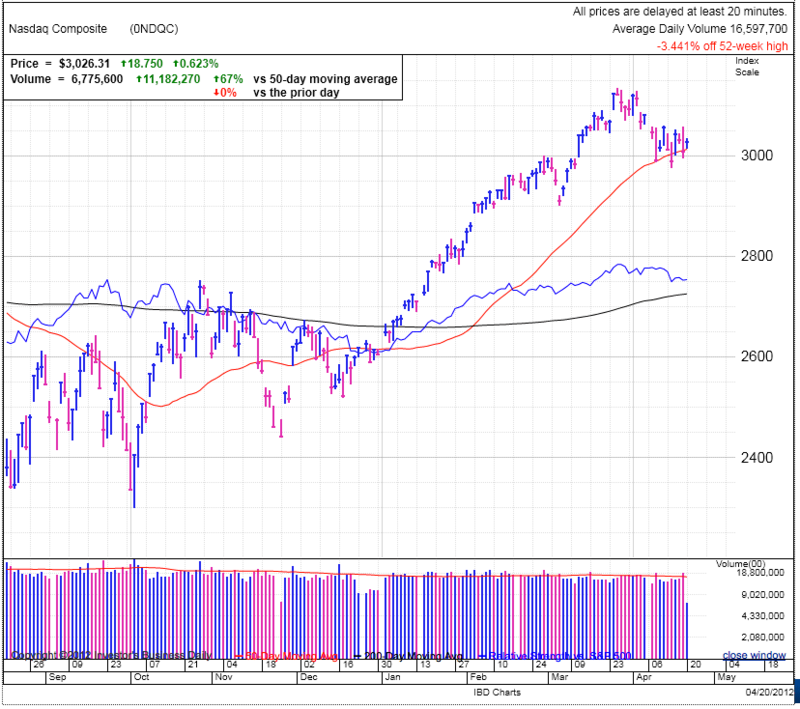 The NASDAQ broke under its support, but the other two indexes are holding up for the time being. A break by those over the next couple days could signal this correction still has room on the downside. It is not uncommon to see the markets retrace ~33% to ~66% of a move as part of a normal and healthy correction. This is just part of the natural two-steps forward, one-step back process the markets use on their march higher. On the S&P500 this gives us a pullback range of 1347-1275 if we use the Dec dip as the start of the current move, or 1321-1222 if we use the Oct low. No matter what metric we use, we still have a little more to go to make this a normal and healthy correction. As for how to trade this, we should continue to sit tight and wait for the upside confirmation before buying back in. As for using this weakness to initiate short positions, I’m not sure this down-leg will produce the profit potential necessary to justify the risk. As opposed to bear market conditions that make for the best shorting opportunities, this appears to simply be a normal pullback from overbought conditions. No doubt money could be made on the short side, but you need to be very nimble with your short trades and take profits early and often because this downward move doesn’t appear like it will cover a lot of ground. Rather than look for shorts, I think the smart move is searching for buy candidates holding up well in this sell-off so you are ready for the rebound. But of course markets top when everything looks good so we always need to be wary of what we least expect. 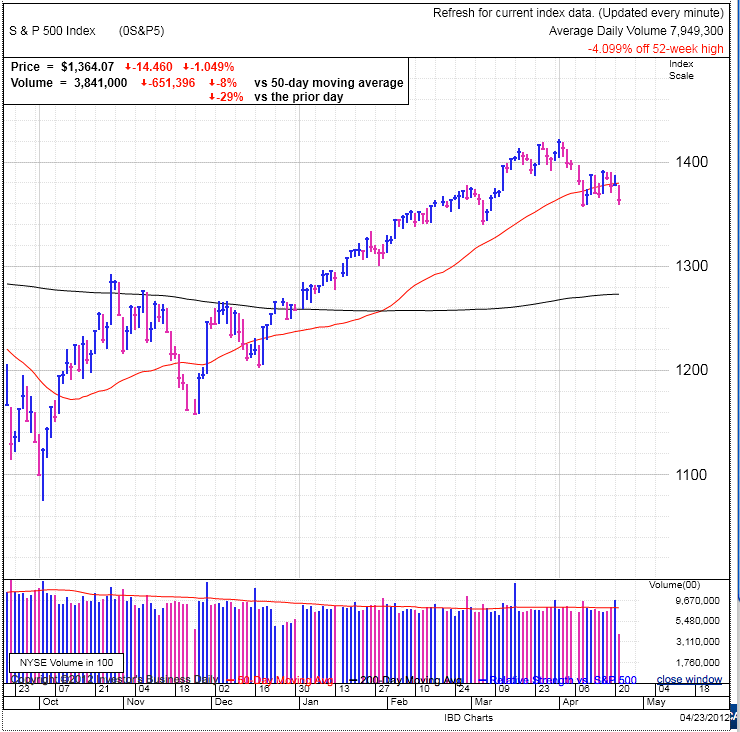 The market again continues to hang out right at the 50dma and neither the bulls or bears have the strength to break the market from these levels. It is still early in the day and we could see a more directional move this afternoon. Today is options expiration so volume will be inflated, but it will still take a price move greater than 1.5% to trigger a follow through day. Ideally we’d like to see volume far higher than yesterday to demonstrate the elevated volume isn’t simply a technicality due to the options market, but is really institutional investors getting behind the upside move on the long side. The one helpful part of hanging out at the 50dma is the average has been inching up with every passing day and so while we are sitting on support, the market is still in a modest up trend. But of course the real tell will be when we break above or below this consolidation in volume. The last few weeks has done a good job of bloodying premature bulls and bears anticipating technical breakouts and they are getting far more gun-shy with each successive humiliation. What this means is the next move out of the trading range is more likely to be the real deal because fewer premature day traders are artificially pushing the market. With a diminished influence of technical and momentum traders, the next price move will be more influenced by institutional investor supply and demand and thus more likely to stick than the recent peak-a-boo breakouts that quickly retreated back into the trading range. There is no grantee the next peak-a-boo won’t also retreat, but the probability of the market showing its true colors increases with each failed peak-a-boo due to the decreased influence of technical and momentum traders. Again, no reason to trade these daily swings and it is best to wait for a confirmation either direction. It is better to give up a little upside in order to improve your odds of success by waiting for a higher probability trade. 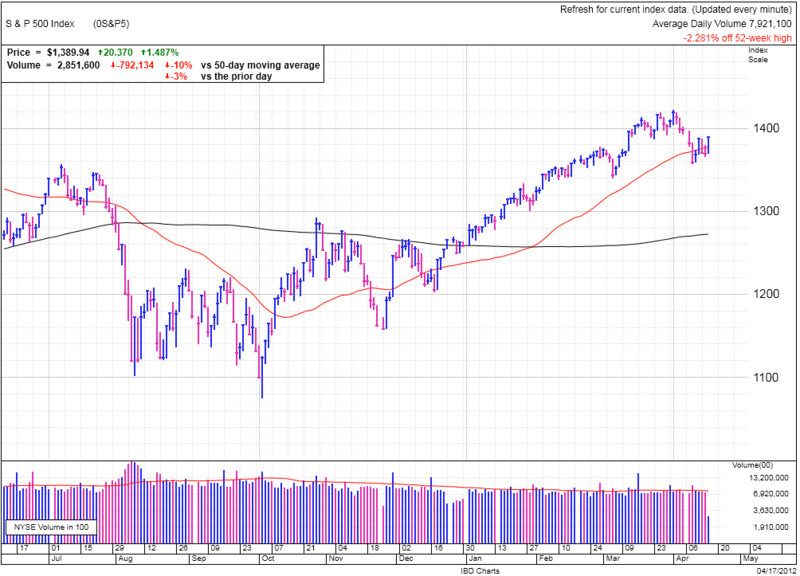 The indexes continue treading water near their 50dma in a frustrating fashion. Up, down, up, down and repeat until thoroughly confused and demoralized. Just like its been for the last week, this price action continues to support both a bullish or bearish setup and the only way we’ll find out is when we get a confirmation from the indexes when they actually move out of this range in a compelling manner. So far all this trading range has accomplished is chewing up and spiting out any premature bulls or bears with overly tight stop-losses. Neither side has the conviction or money to push us outside this range and we will continue to hold here until either the buy-the-dip crowd or the sellers lose the battle when they finally run out of funds to support their cause. This is turning into an endurance race between the two camps and at this stage I really can’t say which side has an edge. Both sides seem well represented in media making it hard to use a contrarian analysis to get a sense for what is the path of least resistance. As far as CAN SLIM rules go, sitting and waiting is exactly what we should be doing right now when current outlook is market in correction. We need to give the market time to prove itself and when deciding how to manage your portfolio, remember it is better to be out of the market wishing you were in than in the market wishing you were out. Aside from the indecisive indexes, we have seen good price action out of some leading stocks. 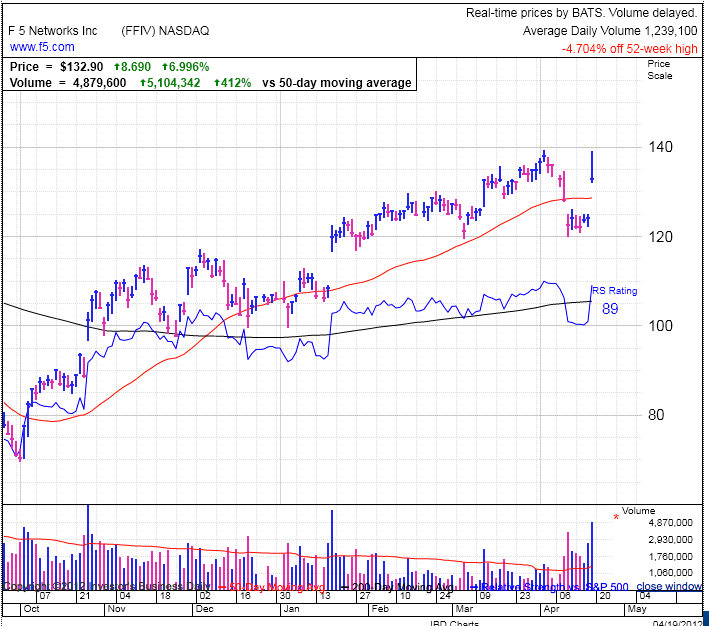 FFIV popped on strong earnings and retook it’s 50dma on a gap-up this morning. Today’s move puts it back in line with its recent highs after dropping under it’s 50dma on large volume a couple weeks ago. This price action demonstrates how difficult it can be to respond defensively to a stock by waiting for weakness to sell. Very few stocks make big moves that are easy to hold and often the biggest winners are highly volatile and do their best to shake traders out prematurely. There was no reliable way to identify FFIV’s April 10th and 11th plunge was just a regular shakeout and not the start of a larger decline. For my personal trading style, I don’t want to be stuck trying to decide if a pullback is just a normal correction or the end of a move and is why I prefer selling into strength after a nice run-up. 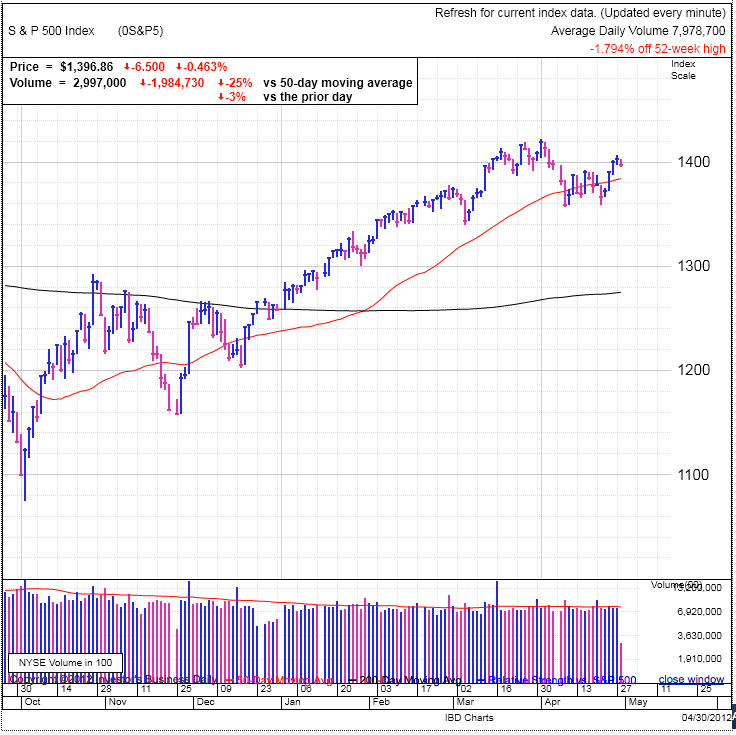 Yesterday’s low volume failed to trigger a follow through day for the market and the lack of conviction by buyers makes it appear the sharp rally was largely driven by short covering coming from bears who piled in on the short side last Thursday and Friday after the market cut under the 50dma. Yesterday’s lack of meaningful follow through seems to be confirmed by today’s listless open and modest decline in the first couple hours of trading. This back and forth action seems to be driven by a small group of eager and premature bull and bear traders who are jumping ahead of the market in anticipation of their predisposed view of the market. But once this smaller group of traders blows their load on a position, the market quickly reverses because big money investors don’t get on board with the move. And given the back and forth with no real net movement, it really seems like big money is taking a wait and see approach. As CAN SLIM investors we follow big money’s lead and that means we should also be sitting tight. Now the last couple weeks have highlighted the difference between selling early and holding through a correction. No doubt sitting through 10-20-30 percent corrections in a stock is demoralizing and challenges a person to maintain their composure. There are two ways to make money in this game, one is by trading and the other is by investing. Obviously trading is short term in nature and the trader has to follow the market closely to time his buying and selling. But on the other side of the spectrum is the investor who finds great stories to invest in and then holds for an extended period of time and sits through multiple price corrections. Psychologically the big difference between the two approaches is the trader watches the market daily, hourly, and even by the minute because he has little conviction in his positions and is mostly catching technical and momentum waves. This is contrasted with the investor who buys stocks he has a lot of conviction in and because of that he is comfortable ignoring price data for weeks or months at a time because he knows his fundamental analysis will hold up regardless of short-term market fluctuations. The problem a lot of amateur traders/investors run into is blending these two strategies in incompatible ways. This would be the investor who follows a stock’s price action daily and thus subjects himself to the emotional turmoil of watching his position go up and down and ultimately tempts himself to bailing out at the exact wrong time on inevitable weakness. And the other side is the trader who doesn’t react to the market’s price moves and allows a small loss spiral out of control as he is waiting for it to recover. The challenge for the CAN SLIM trader who is looking for the home run is we tend to follow the market closely and the method to our making money is riding waves of hot stocks. This daily following of stock prices makes it a challenge to hold through pullbacks, as many people are experiencing right now. This is why some experienced traders recommend having two completely different accounts segregated between trading and investing. This allows you to follow your trading positions daily and largely ignore your long term investments, greatly reducing the emotional urge to sell your home runs at every pullback. Just something to think about as you hone your approach to the markets. As for the current market, we continue to hold in the trading range around the 50dma as big money is sitting on their hands. Trading sideways is often supportive of these price levels, but the longer we sit at these levels makes a potential downward move larger in size. A good analogy would be a coiled spring. The longer we sit at one level, the more potential energy is wound into it and the larger the resulting move will be. For the time being I tend to be slightly more bearish simply because of the strong rally we recently had and how this affected the expectations priced in the market. The bar set for many of these companies is 30, 40 and 50 percent higher than it was last fall and that will make for an interesting earnings season. The thing about the markets is it takes unexpected good new to drive it higher.